Yes, this came out the best part of a year ago, and it’s taken me far to long to get round to covering it. Yet, cover it I shall. Glaswegians Dominicide have nailed a sound which isn’t tapped as often these days, especially in Scotland. However, it is one which will always hold a place in my heart, and, I believe, many others of a certain age. They have managed to take the essence of old school thrash, and bolt it, cyborg style, onto the beefed up frame of 90s metal. I don’t mean ‘Korn and Manson’ 90s metal, though. They’ve seemingly opted for slightly lesser known icons, who you may only be familiar with if you were there. Bands like Face Down, Above All, and Vision Of Disorder. For the most part, however, they have kept clean(ish) thrash vocals at the forefront, more or less in keeping with current British standards. It probably wouldn’t be too far off the mark to guess this lot are fans of Reign Of Fury and the ilk. There are plenty heavier, rasping vox at play, but when singing is present, and doesn’t sound naff, it tends to stick in the mind. 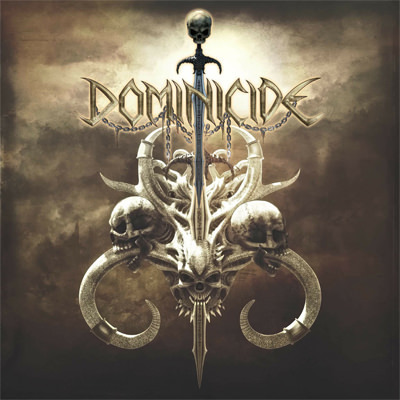 Returning to the comparison of the above mentioned style, which tended to eschew overly technical guitar work, Dominicide actually have an incredible, virtuoso secret weapon at their disposal. Possibly two. It isn’t stated anywhere which guitarist – Craig Law or Christopher Blair – is responsible for the unholy shredding making up the lead guitar sections on this release, or, indeed, whether they take it in turns. One thing can be taken as read, though. It is masterfully delivered at every turn; devastating and utterly top tier. As stated at the beginning, this one snuck under the review radar at Slow Dragon Music last year, but that was something which simply couldn’t be left. This sneaky little EP deserves all the attention it can get. It may be made up of recognisable parts, but the end result is a distinct form. Naturally heavy and intense, bringing old and slightly-less-old together, with great song structures and playing, this is very worthwhile checking out. Posted in Latest News, Reviews and tagged Dominicide, Heavy Metal, Metal, Reviews, Slow Dragon Music, Thrash Metal.